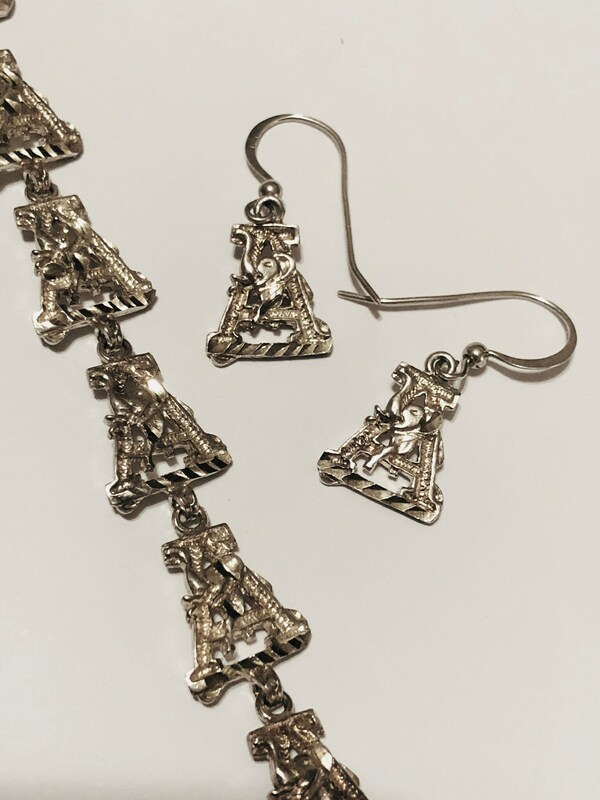 University of Alabama Crimson Tide Diamond cut Sterling Dangle pierced earrings and 6.75 inch bracelet set. Note: Friend, We do our very best to source items in fantastic pre-loved condition. All Sales Are final and items are sold in as-is vintage condition. No refunds or exchanges. Possible scuffs, dings, scrapes, and chips to the finish may be present and/or wear or to the upholstery. (see photos). Pick up in-store at Alford Avenue Antiques for a 15% discount. Mention this ad. Discounts cannot be combined. Ask for additional information or photos. We cannot refund your purchase because you think shipping to N.Y. or LA or your city is too much from Alabama. We refund shipping overages greater than $10. All jewelry ships for a flat rate of $20. Thank you for looking. Know that God loves you.